Claudia did a BA and MA at Aix en Provence University, then a Postgraduate course at Southampton University. She is also a Member of the Institute of Linguists (MIL). At present, she is a French/ Spanish part-time teacher in a small private school. She also teaches English to Years 2 and 3 pupils. 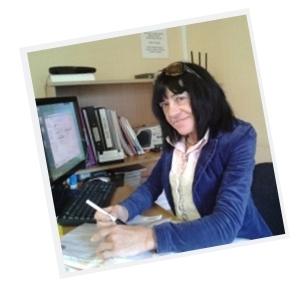 She has been teaching for 30 years to children of all ages in large Comprehensive Schools where she was Head of Modern Languages, then in Private schools where she enjoyed teaching French and Spanish to smaller classes. She has also been teaching Adult classes in Colleges of Further Education in Surrey and Hampshire. Teaching at Degree Level is certainly a very enjoyable work because it demands research from both the teacher and the student. She appreciates the different challenge of teaching adults who are interested in rediscovering a Language they might not have enjoyed at school or simply want to take up the study of French for their work or because they are moving or simply travelling to France. Her examinations results have been excellent throughout her teaching career, thanks to her insight into examination Boards such as AQA as an Assistant Chief Examiner. In 2012, she had 100% pass in her G.C.S.E. Class with some 'A's and 'A*'s. She had equally excellent results in previous years. At a time, when the Examination Boards are aiming to produce more Academic Papers in Final Examinations instead of "Controlled Assessments" done in class, in lesson time, with the help of teachers, she is looking forward to teaching pupils how to tackle more demanding papers, after years of 'watered down' G.C.S.E. and 'A' Level examinations. This is when Study Skills play a key part in the teaching for SUCCESS. Claudia passed the Educare Child Protection Training LEVEL 2 with a 100% score. This is the latest 'Child Protection Awareness in Education' programme which provides additional reassurance to all parents.